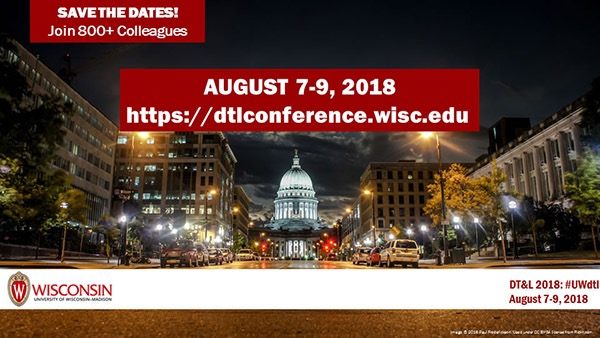 Whether you're new to distance education or have years of experience, UW‑Madison's Distance Teaching & Learning Conference is the place to be July 25-27, 2017. Join colleagues from around the world to share strategies, best practices, and innovative ways to teach and support online learners. Early-bird registration is just $535 for 3 days of learning and networking. For an additional fee, attend preconference workshops, conference blended certificates, or the DE Research Symposium to dig deeper into issues that interest you most. Early-bird deadline is June 26, so don't delay! I am at the 31st Annual Conference on Distance Teaching and Learning in Madison this week. To my mind, this is the best conference that focusses on online learning (full disclosure: I am on the conference planning committee). On Thursday, I will be making an Information Session presentation (Building The MiniStudio: Efficient & Effective Online Video). A video presentation, materials, and hyperlinks can be found here. I am going to be at the 31st Annual Conference on Distance Teaching & Learning (11th - 13th August, 2015) this year. 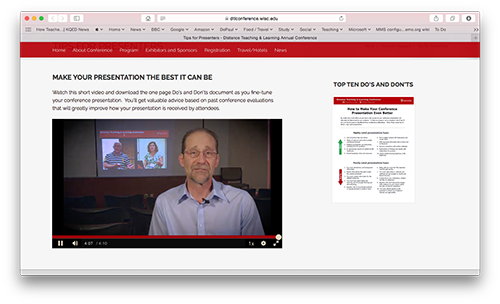 DEPD Director Les Howles has some great tips for presenters, highlighting do's and don'ts. This is based upon feedback from conference attendees, and is well worth watching and reading. The handout has 10 things that a successful presenter should do, and 10 things a successful presenter should not do. Ultimately, your presentation should should provide lots of practical tips and advice. We are working to fill a vacancy for an Online Instructor in Distance Education in our Continuing Studies Distance Education and Professional Development department. The application deadline is Aug. 22nd, 2014. Are you interested in joining a team of outstanding professionals to engage lifelong learners through high-quality and innovative programs and services? We are seeking an instructional designer/technologist to work with faculty and staff developing blended and online courses primarily within the Distance Education Professional Development (DEPD) unit. DEPD prepares educators for online teaching and leadership roles through online courses, certificates, and participation in the Annual Conference on Distance Teaching & Learning. You would also develop online/blended courses for a variety of other units in the DCS Department of Liberal Arts and Applied Studies (LAAS). The ideal candidate will have at least three (3) years of demonstrated experience in instructional design and instructional materials development. A Bachelor's degree required; graduate degree in educational technology, instructional design, education/curriculum development or related discipline preferred. This position is based in Madison, WI. Applications are due by September 2nd,, 2014. The University of Wisconsin-Madison is a public, land-grant institution that exemplifies the “Wisconsin Idea” – that the boundaries of the university are the boundaries of the state and beyond. We seek two tenurable or tenure track faculty to provide leadership and contribute to the department’s expertise in adult teaching and learning, continuing education, and distance learning. These individuals will enhance the department’s capacity to conduct research related to continuing education, including distance education. Applicants must show evidence of the ability to develop an excellent research program in adult teaching & learning, and/or continuing education, as well as evidence of knowledge and demonstrated excellence in distance education and teaching adults. An earned Ph.D. in education or related field is required. Applications are due October 8th, 2014. 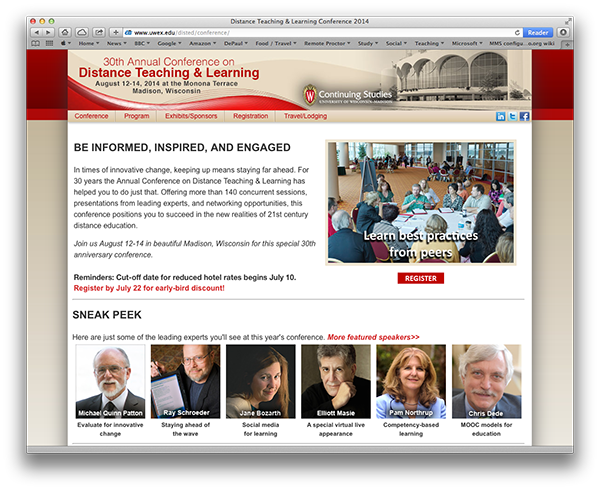 I will be at the 30th Annual Conference on Distance Teaching & Learning being held August 12-14 in Madison, Wisconsin. Sponsored by the University of Wisconsin-Madison, this event is a great place to hear leading experts and share best practices with colleagues from around the world in the field of online education and training. Plus, Madison is a beautiful place to visit in the summer. If you’re not familiar with this event, and want to find out more, I encourage you to visit their website at www.uwex.edu/disted/conference. Hope to see you there. from the 15-minute Speed Session to the 3-hour hands-on Workshop. The presentation slides that Dawn Drake and I plan to use for our Administration & Management CoP at the 29th Annual Conference on Distance Teaching and Learning are available online here. and connect with colleagues from around the globe. workshops, forums, ePoster sessions, and more—plus many networking events. Download the Conference Program and visit the website. Cost: $465 ($505 after 7/22). Group rates and virtual conference option available. Optional Wednesday workshops are an additional fee (space is limited). Questions: Contact Kimary Peterson at disted@dcs.wisc.edu or 608-265-4159. Interested in presenting your best online practices, research, or resources?We invite you to submit a proposal to present at next year’s conference. Choose from a variety of presentation formats depending on your expertiseand experience in the field of distance education/training...from the 15-minuteSpeed Session to the 3-hour hands-on Workshop. I highly recommend faculty and staff involved in online, hybrid, and web-enhanced attend the conference (full disclosure, I am on the Conference Planning Committee). The call for proposals for the 28th Annual Conference on Distance Teaching & Learning is now open. The conference offers a variety of presentation formats to choose from depending on your expertise and experience...from the 10-minute Lightning Session to the 3-hour workshop. New this year is the Speed Solutions format. This is an opportunity to explain your distance education/training problem and your successful solution to the problem. Total amount of time for this format is 15 minutes which includes 5 minutes to discuss and answer questions from participants. 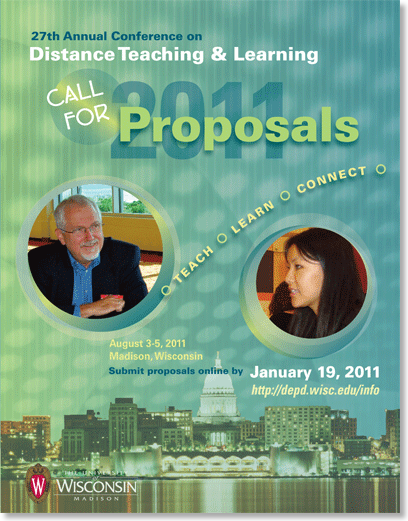 A quick reminder for you all.... the deadline for call for proposals for the 27th Annual Conference on Distance Teaching and Learning ends Wednesday, January 19, 2011 at 4:00 pm--CST. 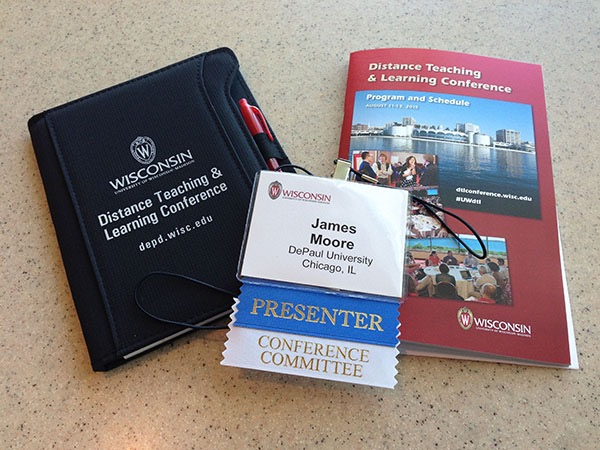 I attended the Annual Conference on Distance Teaching and Learning in Madison last week. I believe this to be one of the most productive conferences in the field of online learning, and try to attend each year. There were over 170 presentations, choosing the right event to attend was sometimes frustrating. Here are some of my notes from the conference. To begin, the conference organizers helpfully package proceeding papers as a PDF. This year I was sporting an iPad, and found this a great way to work through each of the papers. The iPad worked well as a note-taking device during presentations. I will be using this at my next conference. This seemed to reinforce some of my observations. I hope DePaul can participate in a larger rollout of this study. Karen Ford, Susan Tancock and Michael Putman (Ball State University) presented on “Redefining online discussions: A taxonomy to encourage in- depth interaction.” My hopes for this presentation were never likely to be fully met – I am always looking for the holy grail of getting online discussion to totally work - but I found this session to be very helpful. And discussing how students might be gently pushed towards Reflective Practitioner. This is something I see myself returning to. On Friday, Phil Ice’s (American Public University) presentation (Using the Col framework survey for multi- level institutional evaluation) was my highlight of the day. The Community of Inquiry model has proved extremely useful in a couple of DePaul research projects I have collaborated on. Phil used the CoI model to analyze the effectiveness of courses at American Public University. The sheer scale of the operation was both humbling and frightening – the data is being used to continuously improve quality and highlight the effectiveness of new technologies. My presentation (Teaching with Twitter and Google Wave: Real-time social media) was in one of the last slots on Friday. Google had announced that week that Wave would be cancelled, which resulted in some of the presentations I wanted to see being cancelled. Luckily, my presentation demonstrated some of the issues that Wave created – so the presentation was still of value. I enjoyed getting to chat with folks afterwards. 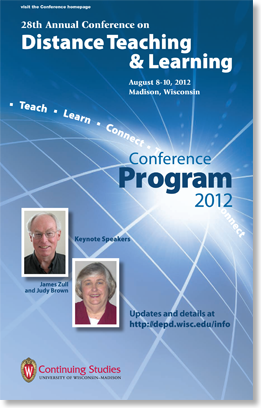 The 26th Annual Conference on Distance Teaching & Learning is taking place August 4-6, 2010 in Madison, Wisconsin.